Many people want to have a safari in a place full of hidden treasures such as a wildlife park. You can make it your real lifetime experience and become a part of that wildlife in Africa where you will hear the roar of lions, the call of hyenas, and the grunting of hippos. You will become one with nature and enjoy the thrill of observing the animal in their true colors. Don’t just dream, come and feel the excitement! Children policy: minimum age allowed for participation is six. Bushwise Safari Lodge is a lodge that combines the real Kruger safari experience with accommodations boasting a unique ambiance. All the rooms are air-conditioned and furnished with a rustic and ethnic touch, inspired by the African bush. All rooms have ceiling fans, air conditioner and mosquito screens in front of all the doors and windows. The bathrooms are en-suite with showers and one room is available with a bathtub. The lodge has an upper deck with swimming pool and bar area with amazing views of the Kruger Park and the Crocodile river. There are spa treatments available at a beauty spa nearby, and that can be booked at at additional cost. You will be picked up and dropped off at the Nelspruit Airport (KMIA) / Kruger Mpumalanga International Airport (MQP). During this four-day / three-night stay, you can enjoy any three of the activities mentioned. All safaris are conducted in a registered open game viewing vehicle. There are full-time guides, who are well qualified and experienced, and will share their passion for the African bush and all its creatures with you. They know the Kruger park like the back of their hand, and if you are lucky the big five will be waiting for you to make your day! Get up close and personal with the elephants. You will go to a game farm to meet these magnificent animals of Africa. They will allow you to touch and exchange greetings with the elephants and experience their exceptional intelligence for about half an hour. All ages are welcome. You will depart at 5:30 a.m. and return late afternoon (at noon on the half day safari). Your personal guide will cook you breakfast, overlooking on the waterholes. You will be served a packed breakfast on the half-day safari so as not to encroach on the game viewing time. There will be a number of stops during the day, in one of which you will have the opportunity to buy yourself lunch. Experience the African bush and wilderness at its best. The Kruger Park boasts over 140 animal species, including the big five (lion, leopard, elephant, rhino, and buffalo) and over 500 birds species. All ages are welcome. Enjoy a leisurely walk on the border of the Kruger Park along the banks of the Crocodile river with a field guide, who will enlighten you with his knowledge and his passion for the African bush. Zebra, blue wildebeest, kudu, warthog, and giraffe are just some of the game that you might encounter on the walk. The guide will also point out the amazing variety of bird species and trees in and around Kruger. The duration for this walk is of one and a half to three hours. All ages are welcome. The horse riding is well suited for both the experienced as well as the novice rider. The horse riding safaris are conducted on a private game farm about 40 kilometers from your accommodation. Riders can explore the unspoiled African wilderness on horseback. Departure from the lodge depends on booking time. No children under six are allowed on this activity. Take a walk on the wild side in the Kruger National Park, get to feel and smell the bush where armed Kruger guides will introduce you to what Kruger has to offer on foot. You will be leaving the lodge at about 4:30 a.m. and be back at the lodge at about 10 a.m. for a well-deserved, hearty breakfast. Tracking of animals and the medicinal use of plants and trees are just a few of the topics that will be covered, as well as identification and habits of birds and animals. Sightings of some of the big five is a realistic possibility. Please note that no children under 12 years old can attend this activity. This is a conducted quad biking experience through a scenic bushveld farm, for around one hour. No children under six are allowed on the tour and children under 12 years are only allowed with adult supervision. On the sunset drive, you get to see all the nocturnal animals of Kruger that are usually absent during the day. Experience an unforgettable sunset that only Africa can produce. Spotlights are provided on the open safari vehicle to help in the hunt for the glinting eyes of nocturnal animals. This is an adventure not to be missed. You will depart the lodge at 3:30 p.m. and arrive at Kruger where the sunset drive will start from 4:30 p.m. to 7:30 p.m. Back at the lodge (if you have booked for dinner as well), a delicious three-course candlelit dinner will be waiting for you in the boma under the African Sky. Please note that no children under six years old can attend this activity. Visit the Swazi cultural village where you will get to learn some of the Swazi customs and ways of life on a conducted tour through the village with one of the local guides. Get to watch them perform local dances in traditional dress and experience their amazing natural African talent for rhythm. Cuisine lunch available for your own account. No visa is necessary. Participants of all ages are welcome. This trip will last five to six hours. 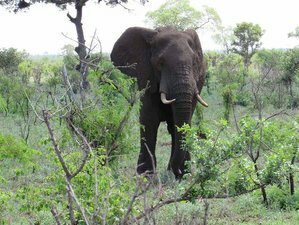 The choice of any three of the following activities: Game Viewing Safari, a Sunset Drive, a Morning Walk, a visit to a Swaziland Cultural Village, Quad Biking, Elephant Interaction, and Horse Riding. This safari will take place at Kruger National Park, in South Africa. The park is one of the most unspoiled natural ecosystems left in Southern Africa. It is a 20,000 square-kilometer park that houses the five most dangerous species to hunt: elephant, lion, leopard, rhino, and buffalo, which are known as the big five. You can also encounter other big animals, such as giraffe, hippo, cheetah, wild dog, and hyena. %This wildlife area is also home to some 33 species of amphibian, 115 species of reptile, and 140 species of mammal, including all the big game species that were nearly wiped out by the hunters of the nineteenth century. Approximately 470 bird species have been recorded there, more than half of Southern Africa’s total. The southeastern part of Kruger is well known for its superb game viewing, with frequent sightings of lion and leopard. Dinner: A three-course dinner served under the African sky by candle light on a daily basis are included in the price of this safari package. Lunch and drinks: A light lunch, soft drink and beverages can be offered at an extra charge. Let yourself be introduced to Mozambique with its Portuguese and African culture. Your first stop will be a coffee shop on your way to Maputo. You will also pay a visit to the town hall and Catholic cathedral, the Steel House, the Botanical Gardens, the Fort and Train Station, the Wood Market (only on Saturdays), the fresh produce and fish market and visit the Polana hotel. You will stop for lunch at a beachfront restaurant where you can enjoy prawns, seafood platters, and local beer not included in the price. Depart the lodge between 7 and 8 a.m. and return about 5 p.m. Visas can be obtained at the border post (for your own account) and you will be assisted by our guide. The price is 2520 ZAR per person and all ages are welcome (Visa fees and lunch not included in price). Visit the Swazi cultural village of the King of Swaziland, where you will get to learn some of the Swazi customs and ways of life on a conducted tour through the village. Get to watch them perform local dances in traditional dress and experience their amazing natural African talent for rhythm. The price is 1080 ZAR per person and no visa is required. Visit the Ngwenya Glass Factory (handmade glass), the Ezulweni Valley, Craft Market (crafts and curios) and Rose Craft (Mohair products). Lunch will be at a local restaurant on your own account. Swazi candles will be the last visit on the list, watch the creation process and meet the artisans. Depart the lodge between 7 and 8 a.m. and return about 5 p.m. Visa’s can be obtained at the border post (for your own account) and you will be assisted by your guide. The price for this full day tour is 1960 ZAR per person and all ages are welcome. You’ll be flying in a fixed wing bantam microlight aircraft over a private game reserve on the southern border of the Kruger Park. Expect an exhilarating big game experience. Flights are conducted early morning or late afternoon and availability is weather dependent. Fly with the eagles with the wind in your hair above our captivating Bushveld. The price of this activity is 1960 ZAR per person and no children under 12 are allowed. On this full-day tour, you will get to experience Mpumalanga’s most spectacular scenery. Visit the charming village of Graskop and the spectacular Lisbon Falls, Mac-Mac Falls, and Berlin Falls. The breathtaking view from God's Window overlooks a sheer 300-meter drop into a ravine which houses an indigenous forest and Kruger Park can be seen in a distance. The natural potholes of Bourke’s Luck are deep cylindrical holes formed by the action of sand and rocks carried down by the water when the river is in flood. You will also be visiting the Blyde River Canyon, the third largest canyon in the world. Lunch will be at the famous Harry’s Pancakes at your expense. Depart between 7 and 8 a.m., return at 6 p.m. This trip is for all ages. The price for this tour is 1960 ZAR per person. All spa treatments are available at a beauty spa nearby (8 km from us). Ask the front desk for contact details to make your booking. Upon leaving O. R. Tambo Airport (JNB), follow the road signs onto the R21S Boksburg. Take the N12 freeway heading eastward toward Witbank. The N12 then joins the N4 freeway. Stay on the N4 as it bypasses the town of Witbank. Go toward the town of Middelburg and then it also bypasses Nelspruit. Go through Malelane toward Maputo. About 9 kilometers after Hectorspruit, you will see a sign that reads Marloth Park. Don’t turn off there, as it is a very bad dirt road. About 4 kilometers further, take the Tenbosch turnoff which is a tar road. Continue along this road for about 10 kilometers until you reach the entrance gate into Marloth Park. About 3 kilometers further, you will find a road sign on your left hand side that reads Waterbok Street. Turn right into Waterbok Street. Continue for about 100 meters. Turn right into Swartwitpens Street at the Y-junction. Turn left into the first street preceding the Y-junction. Continue for about 1 kilometer until you see a T-junction with the river and Kruger Park in front of you. Turn right 5 meters before the T-junction at the ‘Bushwise Safaris and Lodge’ sign. Please book your flight to arrive at Kruger Mpumalanga International Airport (KMIA) in Nelspruit. Bushwise Safaris will pick you up from the airport. The pick-up and drop-down are included in the price. Airport: Kruger Mpumalanga International Airport Airport transfer included: Kruger Mpumalanga International Airport No additional charges. You can request this in the next step. Bushwise Safaris offers accommodation inspired by the African bush, plus a variety of safaris, activities and tours to suit every taste, timetable, and pocket. Children under 2 years old can join free their parents, while children between 2 and 12 years old pay 75% of adult rate.